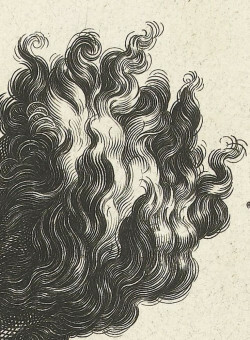 Hendrick Goltzius, detail from Phaëton (1588), engraving, image diameter 32.9 cm. Rijksmuseum, Amsterdam. Love is rarely about composition. We may admire the way a diverse set of parts comes together into something cogent and meaningful—poem, movie, print—but love tends to settle on smaller things: a turn of a phrase, a melancholy tracking shot, a chorus of swelling lines that suddenly swerve into a helical twist of hair. 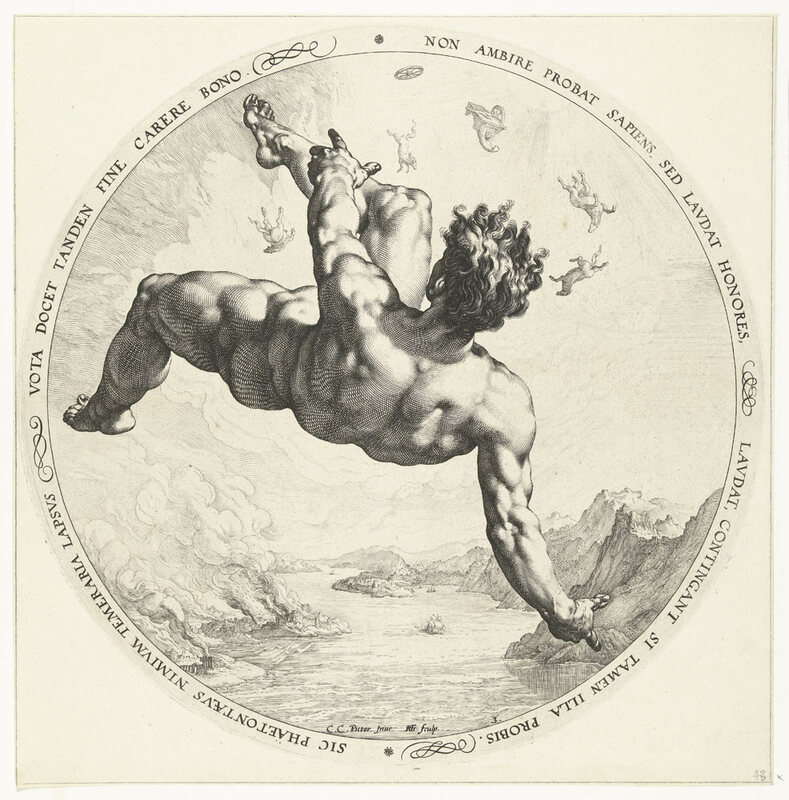 The hair I am thinking of belongs to the figure of Phaëton—that ancient object lesson on the dangers of giving the kids the keys to the car—in Hendrick Goltzius’s engraving. The print is widely reproduced; its clever structure and tour-de-force of anatomical perspective are familiar to anyone with knowledge of art history. Until I was face to face with one spectacular impression, however, I had never noticed that curl of hair—the way it catches and holds the eye, stretching time, stopping the inevitable fall onto the burning cities below; the way, in fact, it changes everything. This is a serious problem for how we discuss and document art: we can reproduce ten-foot-high paintings on ten-inch-high pages, but the encounters that brought us here, to this world where images and things collide, are often locked in the territory of the tiny. So this issue of Art in Print is about details. We asked 20 artists, curators, scholars, collectors and conservators to write about a favorite square inch or so of an artwork. The selections stretch across 490 years and three continents; worlds tumble outward, wormholes invite us in. The quest begin with Dürer: examining the monogram on certain impressions of The Large Cannon (1518), Maik Bindewald has identified a new state of this well-known work; meanwhile Anton Würth, setting out to engrave a copy of Dürer’s St. Anthony, finds not forensics but philosophy in the saint’s casually arranged toes. The indolent thread traversing the lap of Jacques Bellange’s Virgin with Distaff (1612–1616) is unwound by Kate McCrickard, while Joseph Goldyne zeroes in on the unbothered child that Rembrandt placed at the feet of the preaching Christ. Brian Shure strips down the spare eloquence of a 1644 color woodcut from the Ten Bamboo Studio in Nanjing, through its 1952 recreation. Simon Turner locates the genius of Wallerant Vaillant in the glint of Johann Philipp von Schönborn’s left eye. Evelyn Lincoln peers into the shadows beneath the Ponte Fabrizio in Piranesi’s 1756 rendering, while David Bindman shines a light on William Hogarth’s “line of beauty,” embodied by the fluid trajectory of a prostitute’s spittle. Christian Rümelin charts the bewildering assiduousness of Johann Gotthard Müller’s 1804 engraving after Raphael, and Andrew Raftery observes the eerie hyper-focus of Agostino Lauro’s 1845 Engraver’s Daughter. Dian Kriz teases out racial anxieties implicit in an ambiguous white lump in one of Joseph Kidd’s Jamaican views (1838–40). Jay Clarke investigates the physiognomy of grief in Käthe Kollwitz’s Woman with Dead Child (1903). Hendrick Goltzius, Phaëton (1588), engraving, image diameter 32.9 cm. Rijksmuseum, Amsterdam. Paul Coldwell revisits his first, transformative encounter with a Giorgio Morandi etching. Angela Campbell examines how materials become meaning in William H. Johnson’s Jitterbug II (1941), Guy Stricklin shows how one section of a Walter Inglis Anderson linocut evokes an entire ecosystem, and Charles Dean identifies two brilliant printing errors in James Kelly’s 1952 lithograph Deep Blue 1. A chilling detail in Robert Gober’s Untitled (1991 for Parkett 27) is the subject of Richard Axsom’s essay, while Vincent Katz focuses on a mysterious incident in Vivien Bittencourt’s photograph of Roman ruins. Finally, Faye Hirsch looks into a corner of Andrew Raftery’s Open House (2004–2998) and discovers social history, epistemology and love. Roberta Waddell’s selection for the Prix de Print—Bill Thompson’s Edition (2015)—is serendipitously apt for this issue: a work of self-referential, Droste effect recursion, in which the detail contains the whole as much as the other way round. In other reviews, Coldwell surveys the print career of the British painter Bernard Cohen, and Laura Einstein reveals the curious link between Ann Chernow and Albert Giacometti. 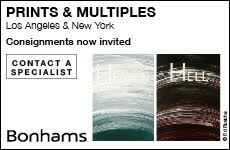 In the News section we report on recent prints and editions in New York and London, the fall auction season, new editions, exhibitions and publications, and other news of the print world. The contributors to this issue encourage us all to do the same.